Practical Hindutva – T Raja Singh. Speech of Thakur Raja Singh (Raja Bhaiya) on 150th Anniversary of Swami Vivekananda at Bhgyanagar (Hyderabad) on 12-01-2013. SANATAN DHARMA-ARYA SANSKRITI-HINDU RASHTRA. STRUGGLE FOR HINDU FREEDOM IN A NEW HINDU AGE. Vayam Rashtre Jagriyama Purohita! ~ ATHARVAVEDA. Back to Vedas. ~ MAHARSHI DAYANANDA SARASWATI. Religion and religion alone is the life of India. ~ SWAMI VIVEKANANDA. Sanatana Dharma is nationalism for us. This Hindu nation was born with the Sanatana Dharma. ~ SRI AUROVINDA. Hinduise all politics and Militarise Hindudom ! ~ VINAYAK DAMODAR SAVARKAR. Salient Points of the Speech of Raja Bhaiya as spiritually galvanized by Upananda Brahmachari. 1. Swami Vivekananda as a Role Model of Hindu Youth of Bharat. 2. Self Reliance and Respect to Bharatiya Tradition and Culture, two basic parts of New Hindutva Regeneration. 3. The Warrior Spirit of Shivaji Maharaj and its appropriate application as a weapon to combat anti-Hindu evil spirit. 4. Greater Unity of Hindu Mass and making of Local Leadership with dedication and sacrifice based on Dharma. 5. Awakening of Hindu Mass with physical and mental power building in the line of Practical Hindutva. 6. Active participation (physically – mentally – financially) in Hindutva movement accepting the challenge of anti-Hindu ~ anti-National force with greater responsibilities. Directly fight against Jihadi and anti-national elements. Save Go Mata, Hindu Women and Hindu Temples. Fortify Hindu Future of Bharat. 7. Alienating anti-Indian and anti-Hindu political forces like MIM (Majlish e Ittehadul Mulimeen) from mass and shut their shops of Communalism and Subversiveness. 8. Co-operate with Police and Army while they are fighting for National and public interest in so many challenging situations. 9. Making a bridge of collaboration in different Hindu Organisations and creating thousands of inspired souls like Sivaji Maharaj, Narendra Modi or Raja Bhaiya. 10. 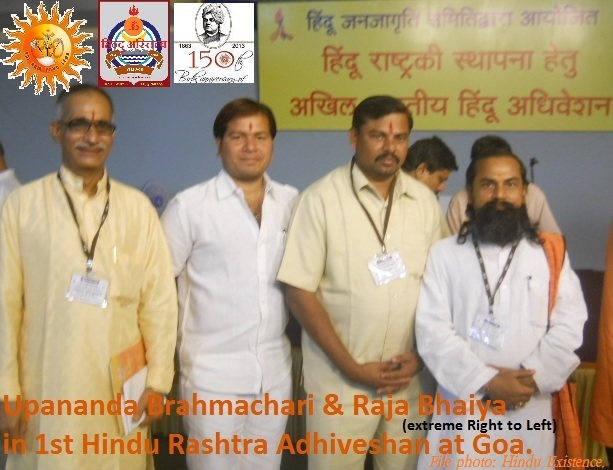 Re-establish Hindu Rashtra-Dhrama Rastra-Ram Rajya in Bharat of everybody’s pride and participation. Hindu Rashtra by 2025 !! JAI SREE RAMA !!!! Resist the Muslim population growth rate by any means, so that Muslims continues to remain less than 10-12%of the total Indian population. All methods should be applied to control the muslim population growth rate in India. This entry was posted on January 15, 2013 by hinduexistence in Attack upon Hindu Temple by Muslims, Attack upon Hindus by Muslims, Conspiracy against Hindus, Cow Protection, Fatal Love Jihad, Hindu Conference, Hindu Demand, Hindu Education, Hindu Existence, Hindu Freedom Movement, Hindu Heritage, Hindu Honour, Hindu Leadership, Hindu Movements, Hindu Nation-State, Hindu Politics, Hindu Rashtra, Hindu Struggle, Hindu way of Life, Hindus against Jihad, Need of Hindu Vote Bank, New Age Hindutva, Practical Hindutva, Save Hindu Dharma, Save Hindu Saints - Hindu Shrines - Hindu Society, Save Hinduism, Save Holy Cows, SAVE HYDERABAD FROM MUSLIM JIHADI MIM, Save India from Supremacist Islamic Conspiracy, Stop Islamic Menace in India, Stop Islamic Terror in India and tagged Awakening of Hindu Mass, Bharatiya Tradition and Culture, Bhgyanagar (Hyderabad), Combating Communalism and Subversiveness, Hindu Existence, Hindu Rashtra - Dhrama Rastra - Ram Rajya, Hindutva Regeneration, Practical Hindutva, Raja Bhaiya, Raja Bhaiya's speech on 150th Anniversary of Swami Vivekananda, Speech of Thakur Raja Singh, Upananda Brahmachari.